A short while ago, we checked out the incredibly cool – not a term I use lightly – smartphone-controlled paper airplane by the name of PowerUp 3.0. The concept was simple: make yourself a paper airplane, connect it to the precision-crafted hardware, and, using the app, fly it around for half an hour. With that product having raised over $600,000 (of a $50,000 goal) with many weeks still to go, another product has emerged to try to pique the interest of flight enthusiasts, and it’s arguably even more exciting than the PowerUp 3.0. The SmartPlane has a few similarities to the PowerUp in that it’s a Bluetooth connected, iPhone controlled RC plane, but this is where the comparisons end. The PowerUp, as per its name, offers a versatile, nippy design that brings bursts of speed and sharp changes in direction. This is all fun and all, but once you’ve had enough of buzzing around the park like a mosquito, the SmartPlane delivers a more accomplished, professional flight experience. 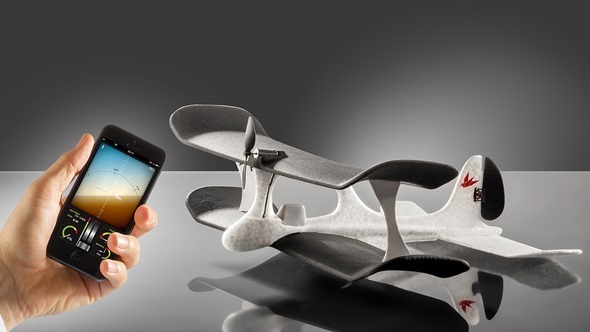 The SmartPlane is definitely built to be more of a glider than a racer, and although you can go full throttle (and drain the touted half an hour of battery life in just five minutes), burning out the device would go against all of the design considerations made in its creation. If the PowerUp were the boy racer, the SmartPlane is the slightly more mature adult, but this by no means insinuates an experience short of pulsating, all-action fun. The company behind it have spent a good two years in optimizing the aerodynamics, and as a result, the plane flies slowly and assuredly. The throttle does let you speed things up now and again, but if you want to maximize the experience and not have to keep charging, then it should be utilized very sparingly. As enjoyable as the PowerUp on Kickstarter may look, this plane, which is also said to be crash-proof thanks its lightweight but substantial frame, seems like it could also be a joy to behold. The accompanying app appears refined, and with Christmas just around the corner, I think I already know which one I’ll be putting atop my list to Santa. Check out the video of SmartPlane in action below!